Little girls everywhere are going to squeal with this new album - Junie B. Jones The Musical Cast Album. Featuring songs from Zina Goldrich and Marcy Heisler from the hit musical. These songs are fun and filled with that spunky Junie personality. Join the beloved Junie B. Jones and a quirky, wonderful cast of characters as they sing and dance their way through this original family musical. It's a new school year, with a whole lot of adventures in store. New friends, new glasses, singing lunch ladies, bossy classmates, kickball tournaments, and juggling biscuits are just the beginning of the lessons learned -- much more than what fits on the chalkboard or could fill a "Top-Secret Personal Beeswax" journal. Junie B. Jones The Musical Cast Album is tuneful, first grade fun for all ages brought to life in a genuinely comical (and not strictly-for-kids) production. 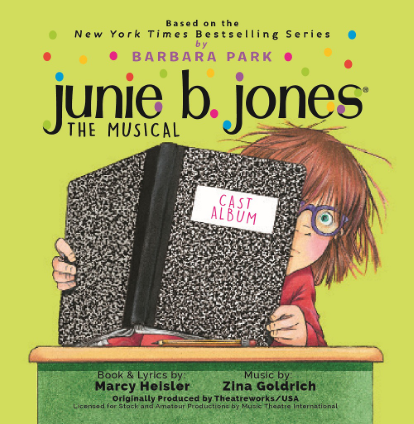 Junie B. Jones The Musical Cast Album will be available at all digital retailers (iTunes, Amazon, and more) and all streaming services (Spotify, Pandora, and more). I haven't been to a musical in some time but these songs bring the theater to life right on my cd player. You can feel the excitement and emotion in each song with the catchy lyrics and fun topics. It feels like you are right there watching live! You Need Glasses is such a fantastic little song - the emotion and drama with the singers really comes out and you just know Junie isn't going to be happy that she needs glasses. I can see this being a big hit with Junie fans everywhere!